Plant of the month. October 2014: KNOCKOUT ROSES – Glacier View Landscape and Design, Inc. The frost rests on the lawn this morning as the misty fog vapors drift off the warm lakes. And what do my eyes behold? That’s right, bright red Knockout Roses still blooming away, as if it were 60 degrees! These roses are fantastic. They are resistant to disease, bloom profusely, and are simply showstoppers! So how do you choose the right rose plants? And where should you plant them if you live in Lafayette, Colorado and what do you do to them to keep them going great guns? Let’s explore that. These roses come as single or double bloomers. That simply means that you either get two rosettes within one flower, or just one essentially, more petals form on the inside of the existing rose bloom for a fuller looking rose. The downside on the doubles is that the rose head is often heavier and the stems on younger branches can droop under the weight of the flowers. Not a big deal really because once the plant matures it will gain strength in the branches and hold up to the weight. The doubles can sometimes remain slightly smaller than the singles in my experience, but both get to about 3-4 feet high and wide. So, choose from the colors of red, pink, rainbow (pink and yellow base), blushing (light pink) and sunny (yellow and white). Doubles come in red and pink only. Secondly, you can find these available as #1 size or #2 size, but for the best chance of survival in Colorado’s harsh climate, chose a #5 size. Plant Knockouts in a good planter’s mix soil that isn’t too heavy. I usually take a common planter’s mix soil available at the local distributors and lighten it up slightly with more compost…but not too much as the straight compost can burn if used too heavily. Dig extra large holes since they do not like our clay soils so much…the more good soil the better. Thirdly, set them and forget them! These roses will do their own thing in their own time with little help from you. They are moderate water users but can handle a pretty wide range of water regimes from quite wet to surviving longer periods than other plants without water. 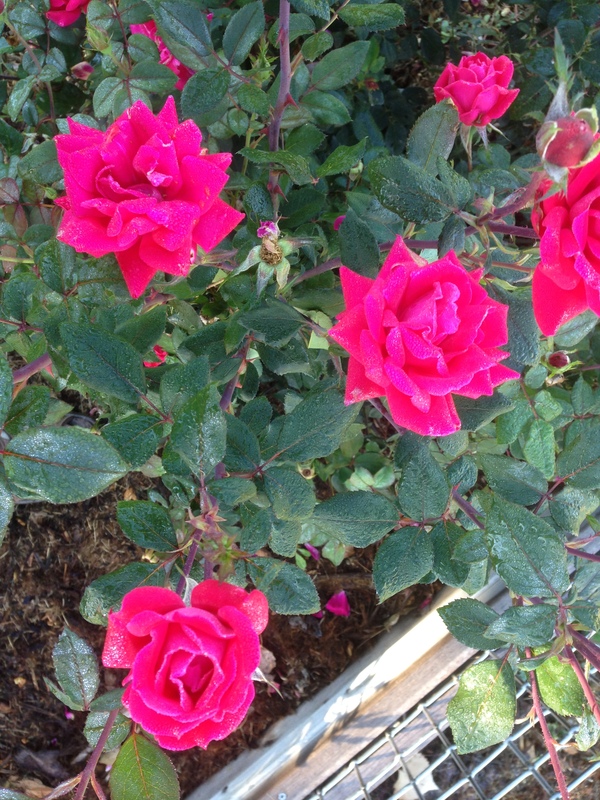 Roses in general are quite drought tolerant, but won’t bloom profusely without moderate watering. I do not cut dead blooms off mine, I just let them keep going and going like the bunny! Certainly, if one has the time, pruning off spent blooms will help new ones form. Lastly, once roses have used up the nutrients from the planter’s mix and compost blend after a year or three, light fertilizing is recommended. I use a Winterizer fertilizer on mine….the same one I use on the lawn…in both fall and late spring. It seems to work just fine. The only pruning I do is to cut them back in the spring to about 12” tall to remove the dead cane that did not survive the winter. I often wait until the new growth shows that tells me what survived the winter and what did not. So plant some, but not too many, unless you like to prune thorny rose canes in the spring! They definitely are a show stopper.